I've got more pics and video that I'm in the process of cropping up. I'll have some more post later today. Well I didn't get any pics last night but I did get the Goose torn down. I'm scrapping the wing and tail but I'll be keeping the body. I did figure out what I think happened with my roll-over. Like I said before, the port nacelle had separated from the wing, but this alone wasn't the culprit. I put her back together with new props just to make sure the motors didn't get smoked and I noticed that the only time the nacelle would flex was when applying left diff thrust. From the video you can hear a rather severe motor change when I start my turn. I think this was when the nacelle first gave way. I've got several ideas I want to apply to the new wing. 2. Vertical centering dowels. So the wing goes on exactly the same every time. 4. Shortened nacelles to accommodate 5" flaps. 5. Engine cowlings. I've got some spray paint caps that look like they'll fit perfect. 6. Wire wing skids. The foam board skids work great, but I can tell it's affecting yaw control. 7. Modified winglets on the tail. Smaller and with bracing. Took me a total of 2 weeks to have the originals ripped off. 8. Airfoil... I'm still on the fence about this. 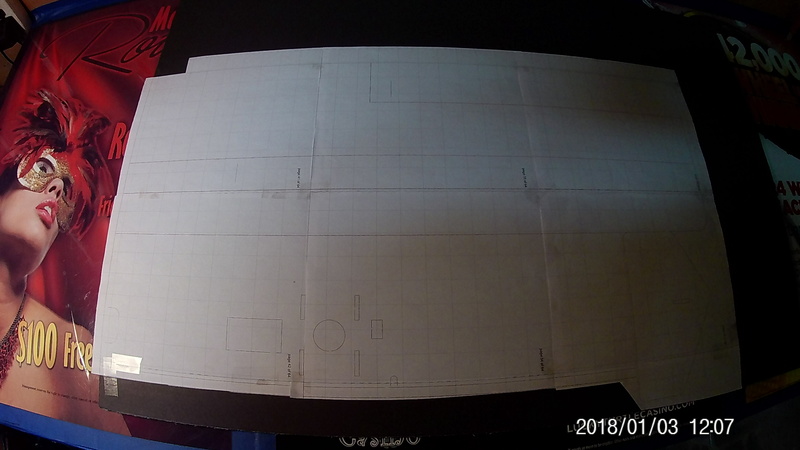 If I do anything, I'll try and just smooth the spar lines. I'm hoping to get started tonight and I should have it finished up by this weekend. I'll toss out some pics this evening on where I'm starting from. 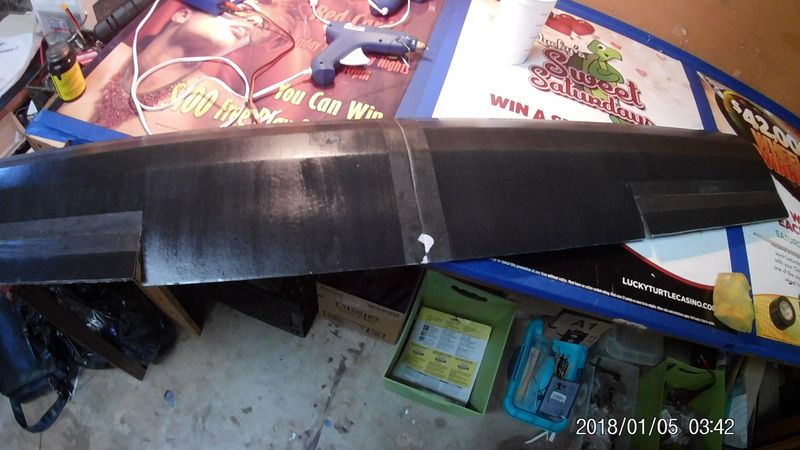 Wing is built, ends sealed with hot glue and coated with EzDope. I don't recommend this process but it was all I had on hand and I've had good results with krylon over EzDope on balsa/tissue. 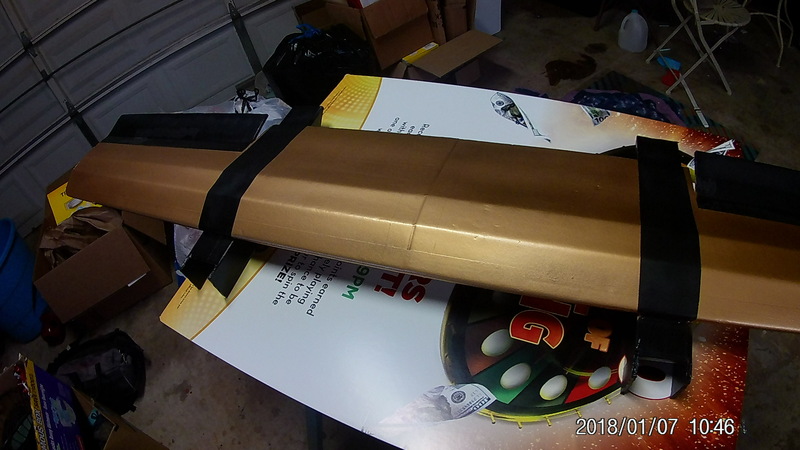 If you use dope, you MUST seal the ends of your boards. Either iron them round, coat with epoxy or hot glue. 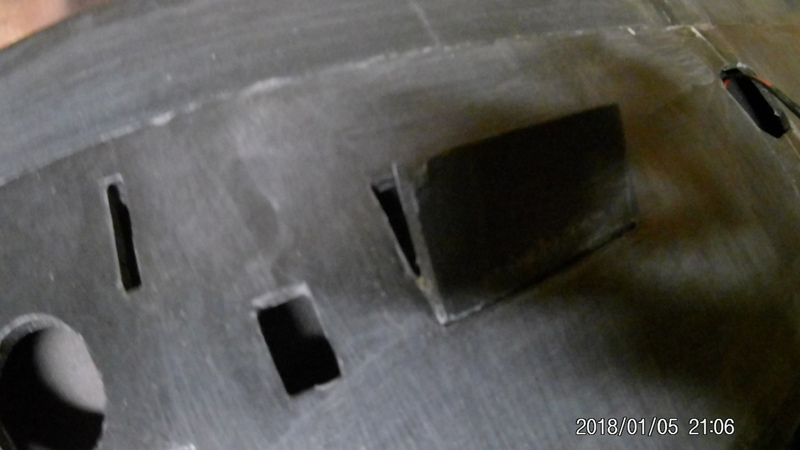 I didn't bother with the hatch doors since they'll be taped over, but you can see where the dope doesn't glue to the foam very well. It does however provide a beautiful base for paint though. I've screwed it up just so I can show how not to do it. I used straight dope and a paint brush on the bottom. Way too thick and sets up on you before you can smooth it out. 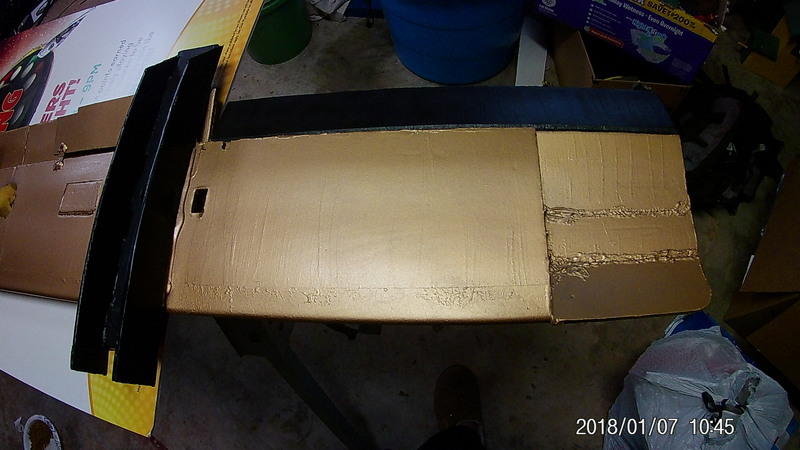 The top of the wing I hit with 3 coats of 75% dope to 25% water with a sponge. Needless to say it turned out WAY better than the brush. I did manage to sand out the brush strokes and after 3 more coats of dope the bottom is slick as well. I also added split flap servo mounts. 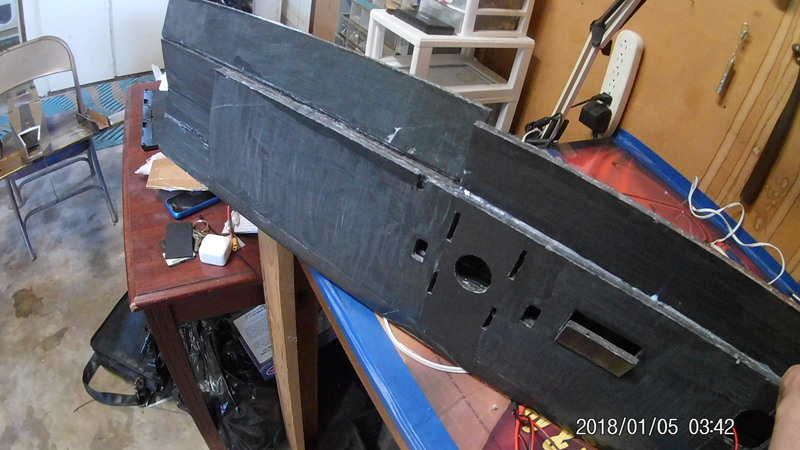 I moved the hatches inboard 3" and put the servo right where the outboard aft corner would have been. I'm going to try out these new clutch servos I picked up on Amazon. They're digital metal gear but have a pop-cog so you can't strip the gears. It doesn't have enough torque to pop the clutch on its own power so I'm pretty confident it'll hold up. Plus the resolution is WAY better than the $2 gems I was using. Lastly I added a receiver battery. Don't really have a good reason why but here's my excuse anyway. I plan to add a LOT of servos to this eventually. Especially when I get gimbals made up for true FPV. I'm also going to be adding some lighting and possibly gyro. 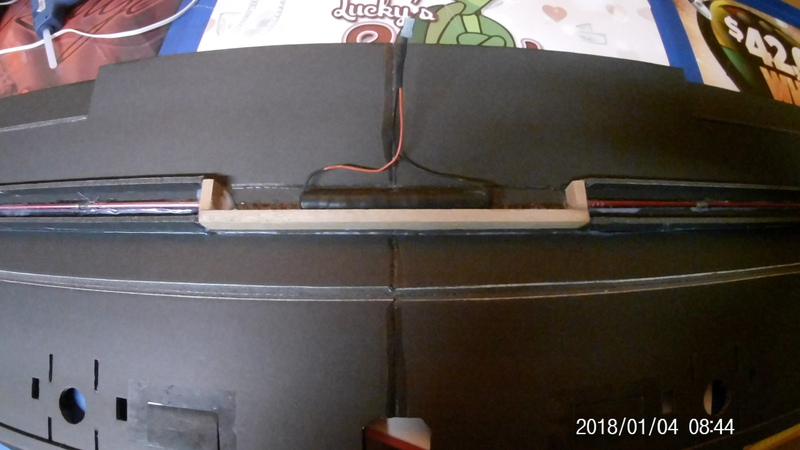 So, I made a 6v 5 cell 1100mah nicad tube. I created a nook with hardwood for the spar and as a cavity for the battery to sit in. From there I'll tie it into a 3 way switch on the fuselage to turn on/off/and to a charge circuit that routes to a female JST connector. I have a 3' male to male jst I can charge with without having to take the wing off. 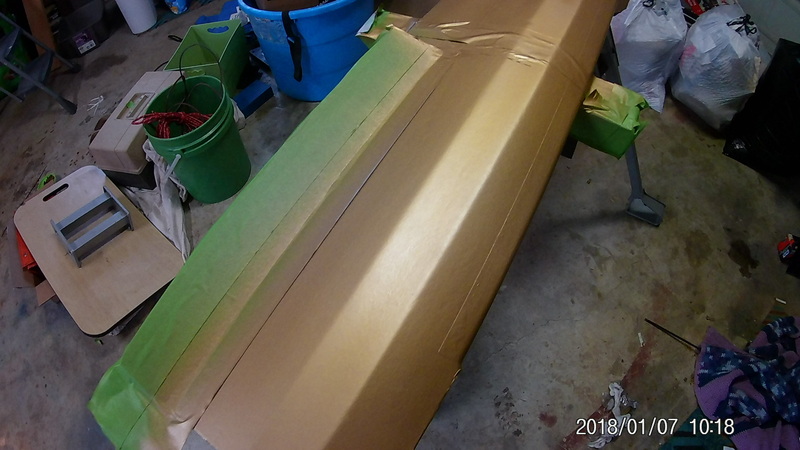 Also there's some fiberglass I added to the forward corners of the outer spars. (Yes, fishing poles). The whole master plan is to center all of my weight along the wing-line. The receiver battery is directly centered in the CG of the wing. 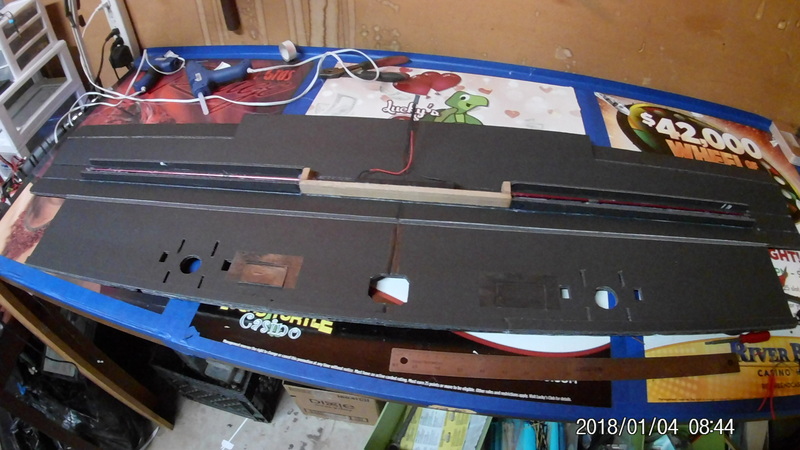 I'm moving the engine battery to the top of the fuselage, along with all of my wiring and electronics. Hopefully this will disrupt the heavy-pendulum tendency it had with rolls. Plus it frees up the entire bottom of the fuselage for cargo. Had way too many stuffed animals get hung up in my battery wires before this. My only other add is going to be a different design on the nacelles and some wire wing skids. All I like from there is new tail feathers and a a new nose. I do love this black foam board but it's exactly like the white. Gotta be careful with peeling tape. I'm actually going to be using some of the foam board you see on the table. It's super thick glossy paper so I'll de-skin the inside. I'm also going to add a skid-bump where the front nose gear would be. 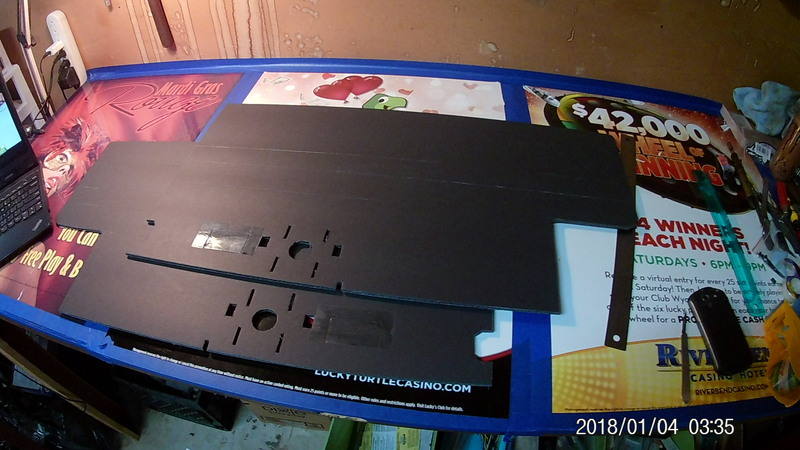 The new wheel pants will be my rear skids (also being made of the gloss foam board). Anyway, I'll post again tonight after I get the nacelles on and the wing painted. Keep em level!!! So I finished up the nacelles and flaps last night. Added a bit of reinforcement to the powerpods as well. 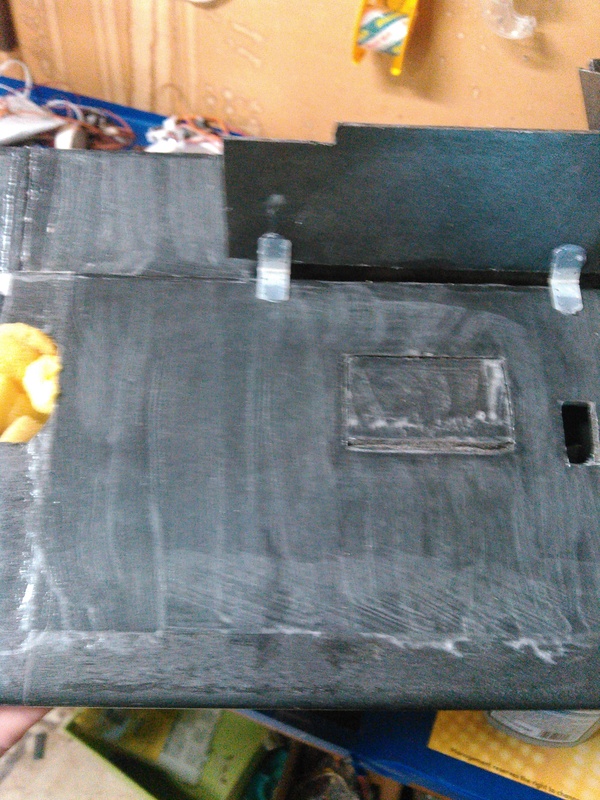 I think my thrust angle was starting to suffer because of the foam beginning to crush behind the firewall. Everything got one last coat of dope and should be ready to paint this evening. I know the hinges look odd but I was shooting for a split/slotted setup. I'll have to push the servo horns toward the back but I don't think it'll be a problem. 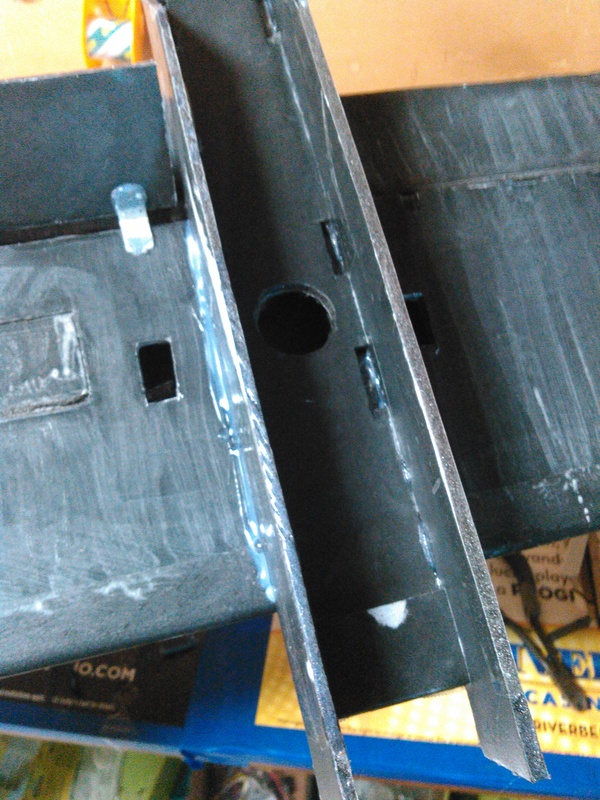 I had to notch the inboard side of the flaps to clear the rubber band rods on the body. I'm hoping to get the paint on and the tail feathers on tonight. 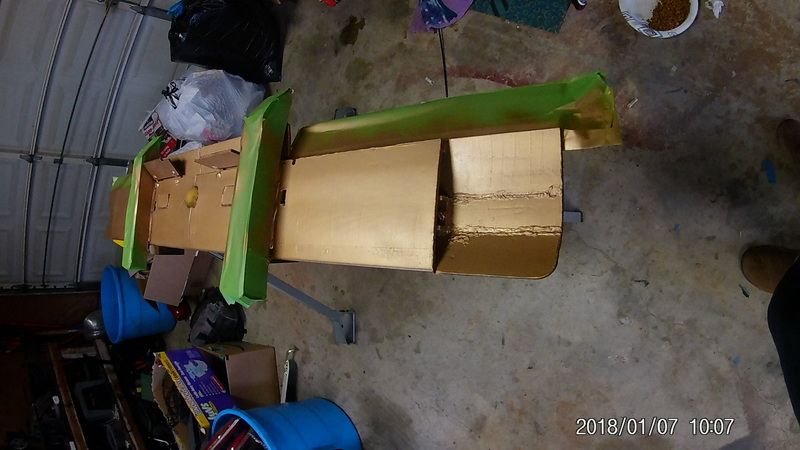 Only thing left then will be the nose cone. Just want to touch base again on this EzDope. I know it's been tested before and I've seen a few videos where foam was water tested after application. Granted I'm not using this for water-proofing, just water-resistance, but I can say if you let this crap dry on your hands, it'll take a full day to pick it all off. Neither soap or water touches it. 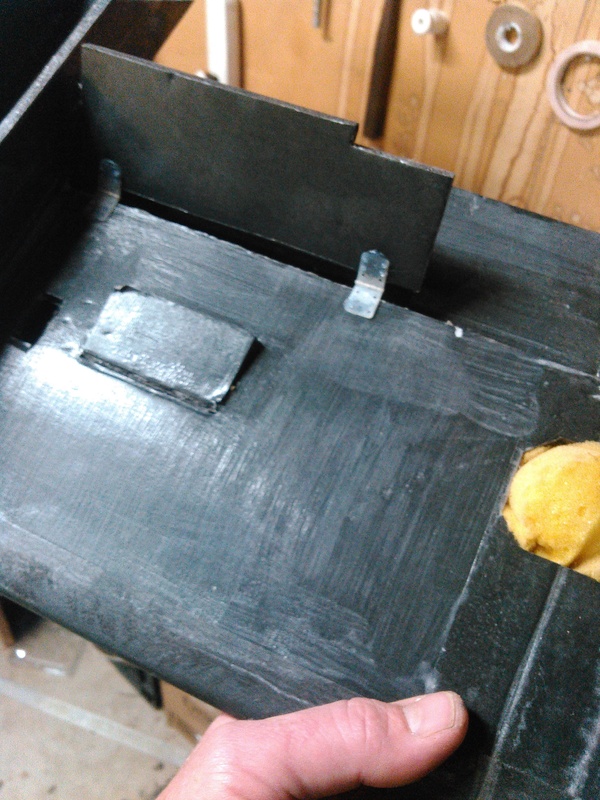 It's still not a very good method, since you have to seal all of your foam before treatment, but it did what I needed it to in a pinch. I'm going to pick up some SIG butyrate dope for my balsa Messerschmidt that's 20% built. I'm pretty sure it'll eat through foam but I'm curious to try it nonetheless. So here's an FT suggestion for all the admins that scour the threads just to read my post (lol). I'd pay good money for FT water-resistant foamboard if you could supply it in different colors. Not only the paper, but the foam as well. My black board came from Adams so I'm sure it's possible. It just makes it so much easier to finish out your paint (or go without any) when you start with the base color you want. (i HATE white edges lol). Anyway that's my rant for the day. Fly On!!! The Golden Goose is gold once again! 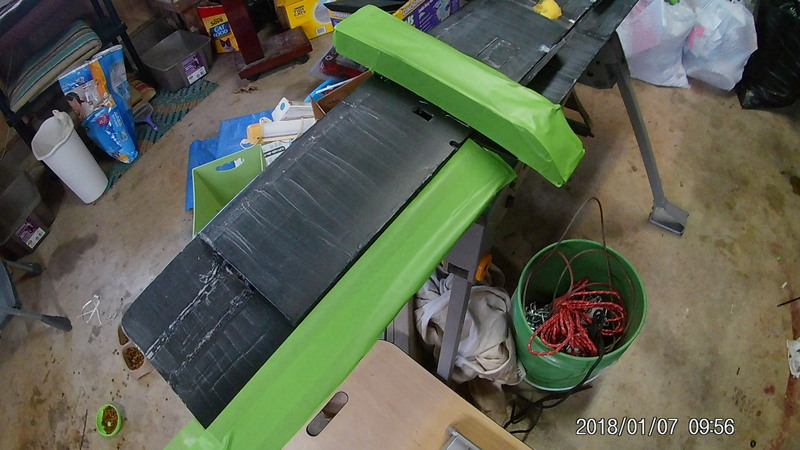 Paint went fairly well, but I do have a "lessons learned" about this green masking tape. Frog Tape is what it calls itself and it does a fantastic job of creating sharp masking lines. Problem is, it does this by bonding to anything you stick it to like it's coated with CA. As always, I prepped each piece of tape with lint off my shirt and it really didn't seem to stick much to my hand. What I didn't realize is that it sticks VERY well to other tape. Everywhere I had taped up with packing tape tried to peel the paint on me. Once it began to peel, it just continued until I ran out of tape. 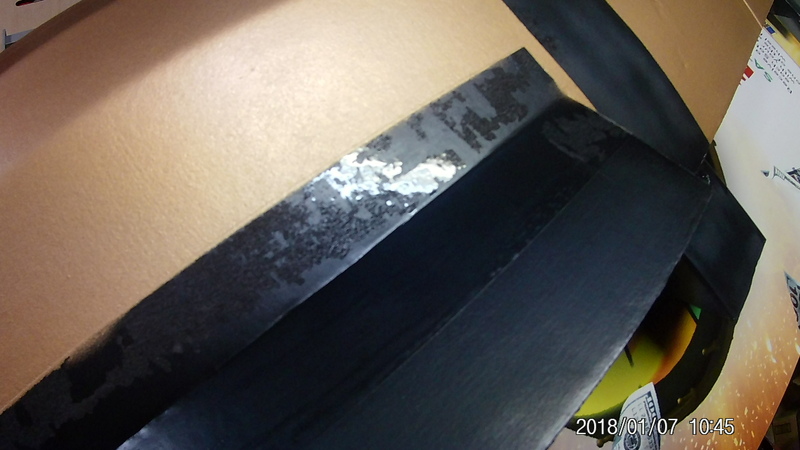 Luckily the only places that peeled were black and should be easy to touch up. I also would have done the doping a little different too. I took the time to wipe all of the dope off of the tape every time I applied a coat. 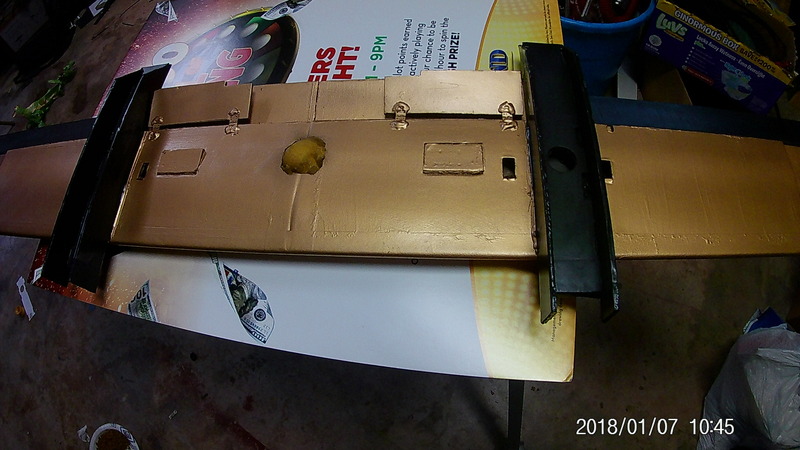 There were a few places that I didn't do this (the leading edge being one) and the paint turned out much better on those spots. I was surprised the dope stuck to the tape at all but it made a great primer and actually helped hide the tape line. The dope I used was a mate finish and it definitely is that. 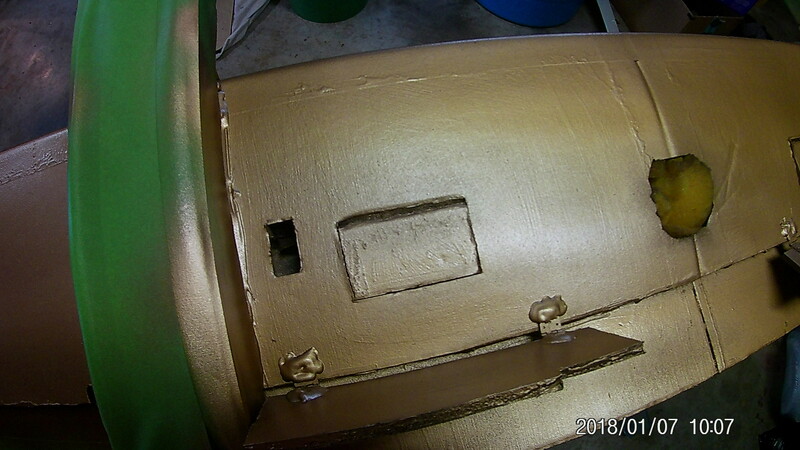 Even after 3 coats of gloss the paint still retained a dull glow. I'm sure if I had more coats and had sanded with 400 it would have glossed up more, but I like the finish like it is. 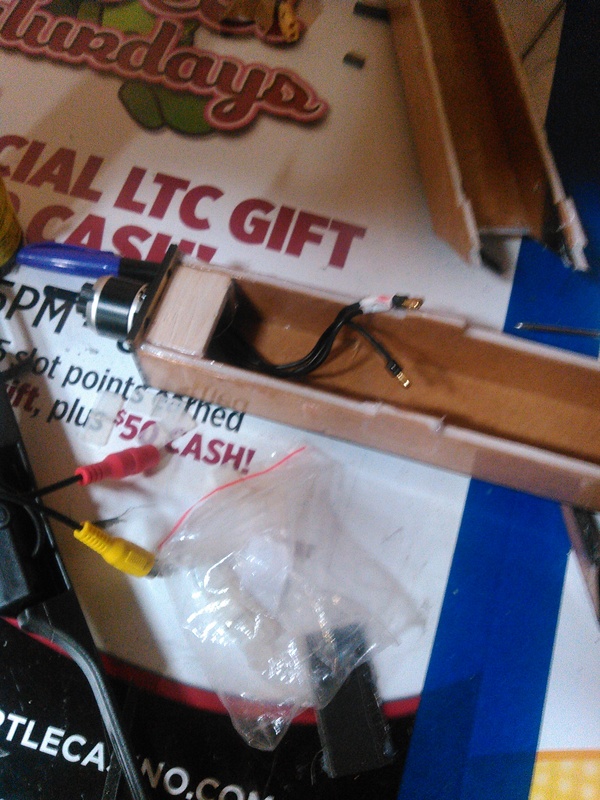 I'll be mounting servos and getting the tail back on the body tonight. I'm going to go ahead and use the old body I built with the speed build kit for now. I do plan on building another body but I'm pushing it for time right now. I can always keep this one upstairs as a backup. Hindsight: I definitely will only use a sponge to apply the dope from now on. Even after sanding and re-coating I wound up with lines in my paint. Also, I tried using Titebond to fill some "bench rash" I let get on the top. You can see where it really didn't blend very well. I didn't have any filler and Titebond shrinks WAY too much to make a decent filler. Next time I'll make sure I've got something else (or just don't dimple it to begin with lol).